Hi there and welcome to the (tone-) world of Rory Gallagher, the late great Irish Blues rocker, songwriter and Strat-o-Blaster. For a rough & sizzling Gallagher-ish tone, starting with the BSM RM would be quite a good idea. Use it with any Strat-style guitar (w/single coils) in combination with a small (15-30 watts) combo tube amp. 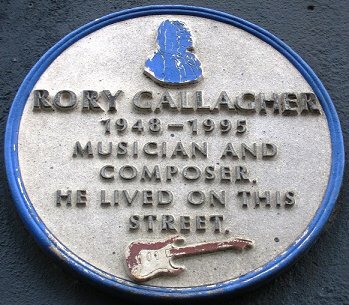 Rory Gallagher (*March, 2nd 1948 in Ballyshannon, Irland / † June, 14th 1995 in London) was an Irish blues/rock guitarist, born in Ballyshannon, County Donegal, part of the Province of Ulster. However, he grew up in Cork City in the south of Ireland. He is best known for his solo work, releasing several albums, and for his tenure in Taste during the late 60s. 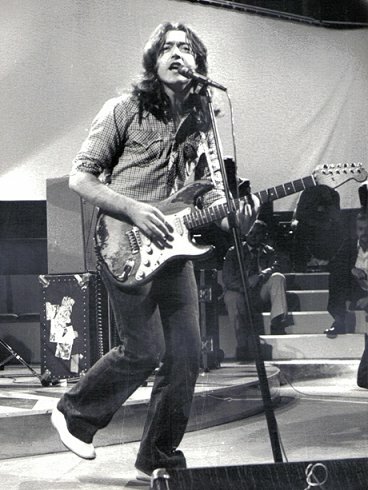 Rory Gallagher sold in excess of 30 million albums worldwide. Gallagher's first bands were showbands which played the popular hits of the day. In 1965 he turned The Impact into an R'n'B group which played gigs in Ireland and Spain. He formed Taste in 1966, but the line-up which gained fame was formed in 1967, featuring Gallagher on guitar and vocals, John Wilson on drums and Richard McCracken on bass. The group released the albums, Taste and On the Boards, and made two live recordings, Live at Montreux and Live at the Isle of Wight. The latter appeared a long time after the band broke up at that same Isle of Wight Festival in 1970. 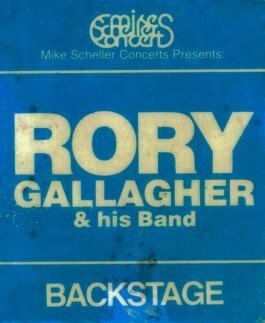 After the break-up of Taste, Gallagher toured under his own name, hiring bass player Gerry McAvoy to play on his first eponymous album (a relationship that would last twenty years on the road) and Wilgar Campbell on drums. The 1970s were Gallagher's most prolific period. He produced ten albums in that decade, including two live albums, Live in Europe and Irish Tour '74, which for many best captured his bands' raw and naturally dynamic qualities.In 1972 he released the album Deuce, which is essentially three-piece R&B. Also in 1972 he was voted Melody Maker's Top Musician of the Year, dethroning Eric Clapton. His album Live in Europe has been a big selling album not only in Ireland but also internationally. Gallagher played and recorded what he said was "in me all the time, and not just something I turn on ..."
When you think of Rory Gallagher his famous '61 Fender Stratocaster (Serial # 64351) comes to mind immediately. And even though Rory was almost inseparably connected with this guitar, he also used many other instruments like a '57 Strat w/maple fretboard, a '61 Telecaster, an Esquire Tele and a Duosonic (all Fenders). He also owned a '58 Gibson Les Paul Junior, a '60 Gibson Melody Maker, a '60 Burns Bison, a Gretsch Corvette from 1957, a Martin D-35, a Martin mandolin, a Stella Harmony and a National Duolian (1932) as well as a Coral Electric Sitar and a Danelectro Silvertone, which he used for recording songs like 'A Million Miles Away' and 'Cradle Rock'. Strings of his choice were Fender Rock & Roll (.010 -.038 or .010 -.040) and he used Herco picks (heavy). Gallagher also owned (and used) a remarkable amp collection: Ampeg VT-44, Vox AC-30, Fender Tweed Twin (1954), Fender Bassman (1954), Fender Concert, a Magnatone combo amp and Marshall 50-watts combos and heads. 'Like most guitar players, Rory was never satisfied,' says Donal Gallagher (Rory's brother and former manager), 'but in the studio, he particularly liked the old Fender Tweeds. If there's such a thing as a gritty but clean sound, that was it for Rory…' And Rory himself once mentioned: 'Marshall stacks never really were my thing; I'd rather have a small, full turned up combo jumping up and down on a chair literally. Therewith I can easily control the sound with the guitar's volume knob and with my fingers. I also don't like playing too loud because thereby the tonal character of the guitar gets lost…' Alright man, the author agrees! And see, this guy used to use coil cords and still sounded awesome :-) Except for an old phaser pedal, or a chorus which he used occasionally, Gallagher didn't use effects at all. 'I do Wah-Wah effects with the guitar's tone knob' said Rory, 'other than that I don't use effects. I just like a naturally overdriven tube amp sound; I like naked guitar…' Sounds interesting, but how'd he get this unique 'naked' guitar tone? Well folks, this was due to a Rangemaster respectively a Hawk treble booster and these units are one major aspect of Gallagher's signature tone! With the RG-model BSM painstakingly recreated the sound of Rory's boosters, so now you, too, can TASTE the delicious tone of Rory Gallagher. He was indeed one of the greatest! May he rest in peace. More infos about Rory Gallagher´s gear can be found H E R E.
Technical Note: Strat pickups manufactured in the late fifties and early sixties, are based on Alnico-rods with hand bevelled tops. As a slight production-variation, the pickups from Rory Gallaghers famous and beloved 61-Strat shows heavy bevelled magnet-tops. Some staff at Fender obviously worked very hard at the grinding machines, while others did not. 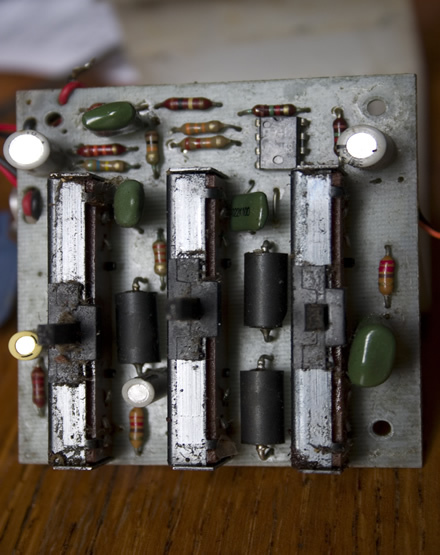 The bevelled tops lead to a modified magnet field, which results in a better pickup output-performance in this case. At the end, the sound gets slightly warmer and smoother. Nailing Rorys sound also means to use such pickups. 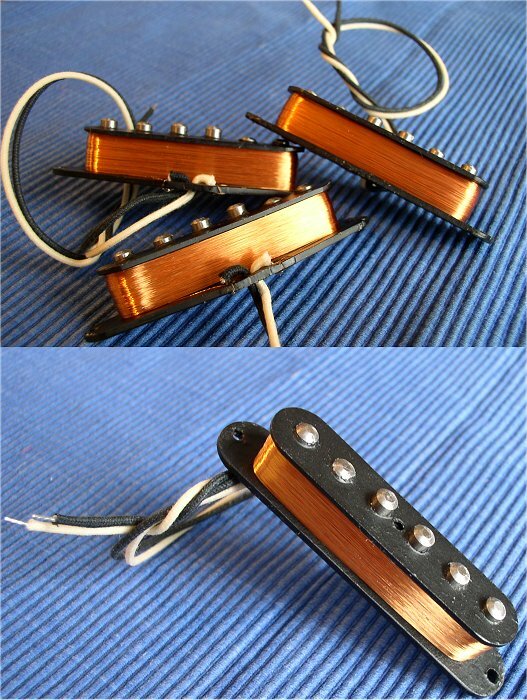 A good choice would be a set of "Fender 57/62" pickups, which lack in having a manually guided winding because they are machine wound - which was not the case at that time - handguided winding was still standard, also the magnets are only smoothly bevelled. Another, possibly better choice, could be LeoSounds "VPS Irish-Tour" pickups - which have all the features needed like scatter-winding, heavily bevelled poles, typical inductivity readings from that time and of course the vintage correct AWG42 Heavy-Formvar magnet wire. Written and researched by Tom Riepl, independent recording artist and guitar player extraordinare. He's running his own webpage and besides playing his guitar and Rodenberg effects all over the world, he's also a writer for the german"Gitarre & Bass" magazine. If you want to contact him, please send him an email.